Mohican beat me again. 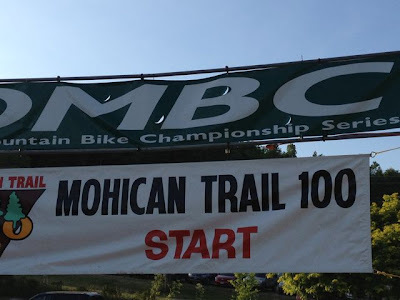 The weather was great, the aid stations were packed, and the trails were beautiful as ever. Best yet, I actually ran a better race this year than I did last year. I kept my pace slow and steady, and I felt strong through most of the race. Ultimately, my stomach got the best of me around mile 55, and I dropped at mile 60. After getting checked in, Farley showed up and we just hung out up at our campsite and started drinking some pre-race beers. Our old college buddy, Jauffrey Fougere, showed up and was going to camp with us for the night. It was like old times at BGSU! Only instead of being ultra party animals, we were ultra athletes. :) It was unfortunate that I had to pack in to my tent early and missed out on catching up with Jauf. We vowed to do it again soon when didn't have to go to bed so early. Farley and Jauf hung out by the fire til around midnight. Oddly, I think I stayed up long after they fell asleep. I had the pre-race jitters and simply couldn't shut my mind off. I woke up to a faint voice saying "Luc... Luc... Dude, you missed the starting line, it's quarter after five..." I shot up like a rocket and said a few choice words... I then gathered myself and started getting ready. My biggest fear was "fighting the clock" and by the time I actually set foot on the trail, I was 45 minutes behind it. Crap! Although, to be honest, it worked out great, because I got to run my own race at my own pace. I didn't have to get stuck running someone else's race while being caught up in conversation. I just focused on staying slow and steady. I did a lot of power walking and jogging on my first loop. I felt strong enough to run, but also knew that I had all day to make up for the lost time and didn't want to use up all of my energy. I felt extremely strong and kept a close watch on my calories, hydration, and keeping cool. I peed like a rockstar so I knew I was staying well hydrated. I never got hungry, so I knew my calories were great. And everytime I started to sweat I would slow down and pour icy cold water over my neck and head. Towards the end of the first loop, I had actually passed a few people. Therefore, I had caught up with the back of the pack and was no longer in last place. This felt great. I ran a few miles with Fred Davis III and got some tips from him on how to finish a 100 mile race. He said I was on a good pace and to just stay slow and steady. It was great to run with him. I've seen him at lots of ultra events. I remember running a few miles with him at Oil Creek 100 a few years ago, and he's always happy and full of stories. One great guy! The first loop was pretty uneventful, I powered through the aid stations and kept moving at a steady pace through the entire first 27.4 miles. 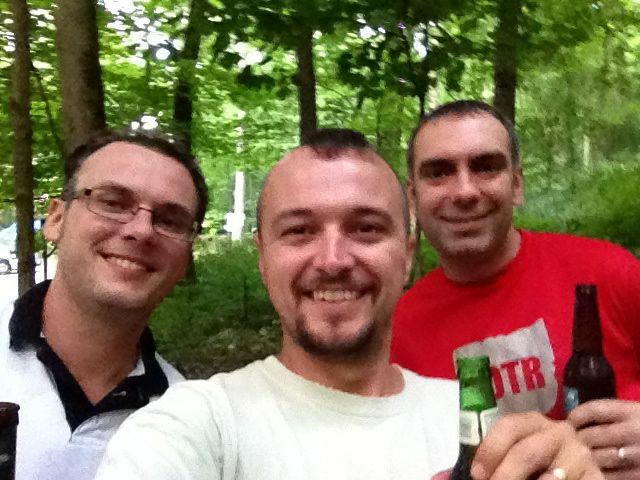 I met up with Farley and Jauf at the campsite before getting back to the start / finish. Farley hooked me up with some ice and I hung out for a bout a minute or two before powering on towards the start / finish. We all had a few laughs about me missing the starting line like Jean Paul in Seinfeld. :) Doh!! As I sat on the bench talking to my brothas, the sun was in full force and the humidity was pretty high. It was about 1pm and I was ready to start my next loop. The sooner I got back into the forest, the sooner I get out of the sun and under the canopy of the trees. I still felt strong and made sure to pay extra special attention to keeping cool. From this point on, I left every aid station with both water bottles full of ice and a large cup of ice chips. I would literally walk with my cup of ice chips in one hand and my 2 ice filled water bottles in the other. I made my own rule to not start running until all my ice chips were gone. It worked great and also kept me motivated to get to the "next" aid station (ie. more ice). I felt amazing through the first two aid stations on my second loop. However, by the time I got to the Covered Bridge, I was feeling pretty gross. My calories were still on par, my hydration was good, I was still peeing (sorry for all you non runners, but this is an important aspect to distance running), and best yet I was staying cool by squirting ice water on the back of my neck from time to time. When I entered the Covered Bridge, I decided I should sit down and get my stomach in order. I killed about 10 minutes here and talked with ultra-rock-star, Jay Smithberger for a while. He had good advice and was very supportive with various tips on how to get my stomach back. Eventually, Shelley (his wife) warmed up some potato soup and then Jay kicked me out of the aid station with the cup and said "keep moving". For the next 2 miles, I ate the soup and crunched on more ice chips. By the time I ascended the switch backs of the Orange loop, I was feeling amazing! I had no more nausea and I was running again. I ran and power walked for the next 4 miles with no worries in the world. It was a great day to be running at Mohican! Around 2 miles later, the sun started to go down. I ended up running 4 miles in the dark back to Mohican Adventures. This caused me to come to a slow walk towards the end of the course. Amazingly my eyes were adjusting as the sun was going down and I was able to see every root and rock on the trail. However, I was not able to judge depth and the trail has lots of dips and mounds all throughout it. I ended up walking very slowly for the last 2 miles before descending down onto the campground road. As I was climbing the dirt road up to the bath house at the campground, I saw a headlight coming towards me. The light said "Luc!?"... It was Farley! He had my headlamp for me and he was ready to start pacing me. It was around 10:30pm by this point and I still felt great after the potato soup @ Covered Bridge. I think I surprised him when I nudged him and told him how great I felt. I was surprised myself actually... I've never felt this good after running 50+ miles before. I was ready to tackle the 3rd loop and we had a plan! We got up to the campsite and I had a few crackers with hummus, and some ice water. Farley and I spent about 2 minutes getting ready for the 3rd loop and then headed down to the start / finish where he would "officially" start pacing me through the night. 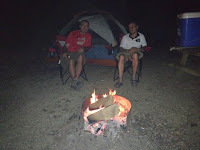 We left the campground eager to run Mohican at night. Quick recap: I had lost some time at the starting line when I slept in, then I lost some more time at Covered Bridge where Jay kicked me out of. My pace came to a crawl from running in the dark, but I was still NOT BEHIND THE CUTOFFS! 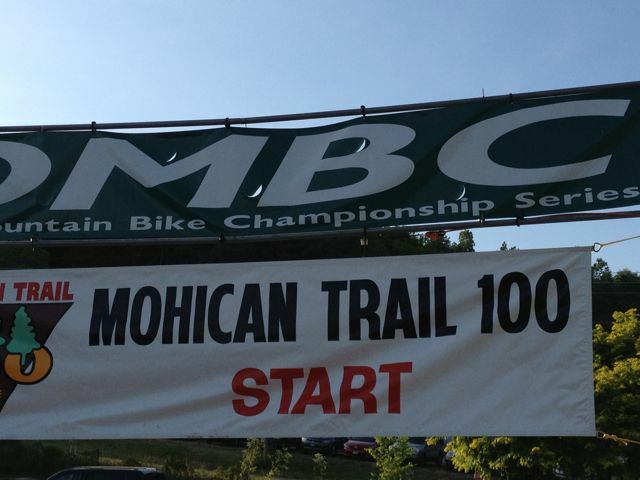 That was huge for me and had me pumped up about being able to finish this 100 mile race. I was one of the last runners in the race and the cutoffs were creeping up on me, but I wasn't scared by this. Knowing that I came into the race 45 minutes late and caught up with the clock after 3 aid stations convinced me that I had nothing to worry about. Farley and I power walked most of the first section toward the aid station. About 4 miles into this leg, I tried to consume a Hammer Gel. Immediately, I was overcome with nauseau and chucked... No warning. No build up. I went from 95% awesome to puke... Just like that! It surprised me, and I'm sure it surprised Farley too. We were laughing and talking and power walking without a worry in the world, then I went and did that... After it happened, I still felt fine so we kept moving. Oddly, I still felt ok... I actually kept jogging after that little episode. About 1 mile from the Park Rd. Aid station, I had to sit down though. My energy had drained and my stomach was starting to feel nauseous again. We pretty much walked to Park Rd. When I got Park Rd., I felt pretty bad; like I could puke at any second. The thought of any food, water, heed, or motion made me want to vomit. I decided to sit down on a milk crate and gather myself. Perhaps my will power was taking a hit here... My stomach is what destroyed me last year, and here I was dealing with it again this year. As I sat on the milk crate, someone eventually suggested a Dramamine. I thought it couldn't hurt, so I took it down and was waiting for it to "kick in". I didn't want to sit back down because my legs were starting to lock up, so I decided to walk back and forth there at the aid station. A minute or so later I started seeing stars and things started to go dark. I felt cooky, so I walked up the road a bit and decided to sit down on the concrete... quickly. I really wanted to lay down on my back and take a nap, but knew that was out of the question. Once the shakes kicked in, I knew that I was probably not going to finish this race. I was now hyperthemic (I think), with gross stomach, fighting the clock, and had 3 miles of darkness until the next aid station. I really enjoy reading your race reports. I think you're probably right about the electrolytes. I know that is pretty critical, especially in hot weather, even when you're running shorter distances because you lose so much sodium and potassium when you sweat. In this heat, I use electrolyte tabs in my water for any run 5 miles or more.